A comprehensive and elaborate home automation system will not be complete without a proper heart that functions as a key control of the whole system. $3,350 might sound a bit expensive, even more costly than most HDTVs, but if you are looking for a features-rich heart for better controlling of your sophisticated home system, ELAN’s XP-8.4 Wireless Touch Panel is something you shouldn’t ignore. XP-8.4 Wireless Touch Panel is a powerful home automation control panel manufactured by ELAN Home System, an award winning manufacturer in multi-room audio/video and home control systems. This new user friendly and reliable wireless touchscreen control panel features fast wireless performance, a vibrant, easy-to-read 8.4″ screen, awesome graphics capabilities, extended range of use and battery life, and a built-in web browser. It made its maiden debut last month at the 2008 CEDIA Expo in Denver. This XP8.4 allows users to do real-time checking and monitoring of all data received from the compatible linked-in controllers for various home systems such as lighting, temperature, security, ventilation, pool, etc. All data will display clearly on the 8.4″ screen and the panel battery can last for six hours. Besides functioning as a control panel, ELAN has enhanced and added more features to make the panel become more PC-like. Users can just connect an input device such as mouse or keyboard to its USB board and they can use XP-8.4 as a PC to do web browsing. 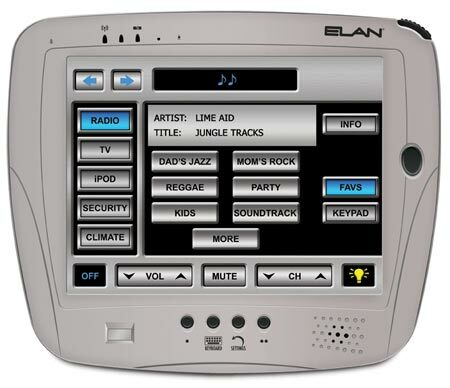 ELAN’s XP-8.4 features seamless web browsing with streaming Internet audio/video and Flash Player support. Users can browse internet, watch YouTube video clips, and so on.